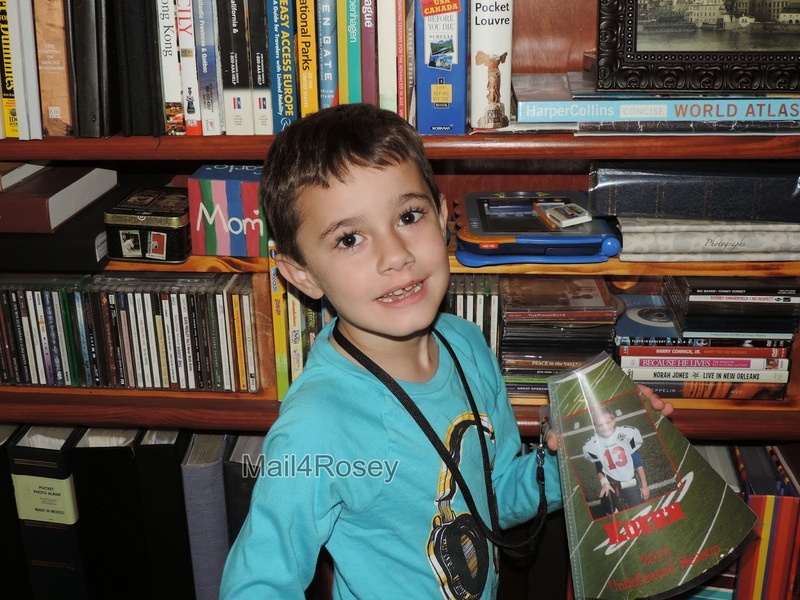 Mail4Rosey: MegaFan Sports Megafold Review and Giveaway! They've put the child's name, year, & 'undefeated season' on theirs. MegaFanSports has this really easy to make, custom insert megafold, that we really like! It's a fun way commemorate a special season, cheer on your child (that's how we'll be using ours), or even use as a keepsake. The process is easy and very flexible. First you pick your sport, and the background you like from it. Then you select the layout pattern you want for your pictures, and you upload your photos (there are arrows to situate and size them). The example that came in my kit is seen above. You can have anything written that you like. Choose your color, font, size, and placement easily with their very user-friendly software. Then you select what writing you want on the megafold insert, the color you like for the letters, how big you want the writing to be, and where (and what direction) you want the writing to be placed. I didn't select any writing for mine (and you can do that too if you want), but you can see an example of how the writing looks in the example insert they sent me with my kit (above). You pick your lanyard color. We chose black for ours (so it matches any outfit ;) ). A lanyard (to conveniently wear it around your neck) is included, and you get to pick the color. When it arrived, we set right to work on creating ours. The first thing we did is carefully disengage the insert from its cardboard sheet. The first thing we did when it arrived was get to work at putting it together (which really was a piece of cake). It was simple and literally took us under ten minutes to complete. Of course your children can help too, but if they're very young you'll want to help them with the perforation so it doesn't rip. The whole sheet before creating the lanyard is in the background. My megafold is on the left (it's in the plastic casing), their example is on the right. Here's a picture of my little one with it, so you can get a good feel for the size. See the lanyard conveniently holding it around his neck? Now we're ready to cheer! I think these would be great for individuals, families, or group projects/settings. You can learn more about MegaFan Sports by visiting their website. You can also visit them on Facebook and/or Twitter. One lucky winner gets a pkg. of two to design and call their own. US entrants only. There are so many cool things out there. There really are. After they have finished the season, it would be perfect to put in a shadow box. Maybe toss in a season schedule and their jersey if they got to keep it! That's a great idea! It would be really cool to have everything from the season all together. That's really cool! I'll have to look into this for my nephew and his Tai Kwan Do. I love this. This is so cute. And my son would love to do this. Thanks for sharing - I didn't know anything like this existed. This is so cool! I'd love to use this for my Goddaughters and all of their sports. That is cute. We don't have any sport players in our home but know of one I can tell about this. These are very Cute, I think they are a great idea. They all get their very own personalize Sports Megafold. Must be super exciting for the kids. What a neat idea! I would love to make one for the boys nana, too!! What a cool idea! You always find the neatest things to try. Yeah, I love stuff like this. It's so much more personal than a random, generic gift or keepsake. This is so cool! It would have been perfect to have these back when my niece was playing sports. This is really neat! I bet this would be really cool for kids of any age. That is awesome! 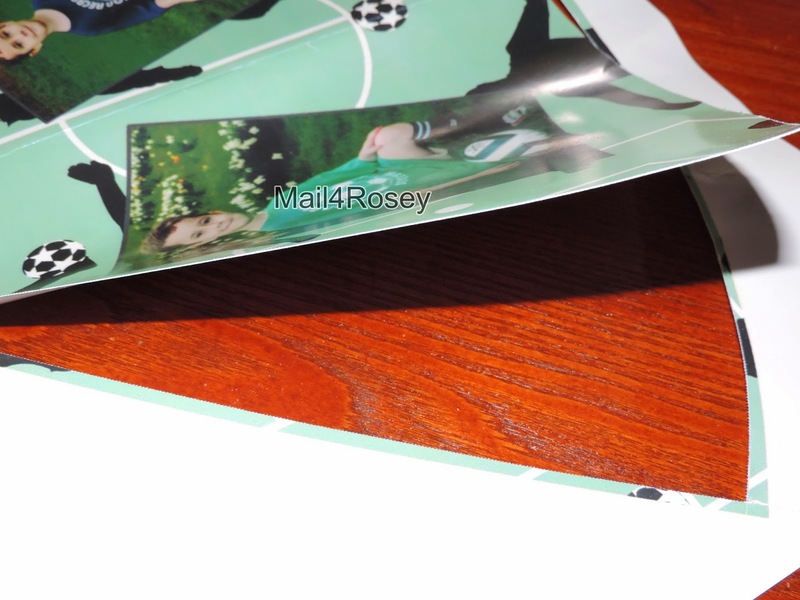 & I love that I can get it for soccer & put both of my kids pictures on one. I learned that they are located in Placerville, CA. My nephew Elijah would love this. My goodness! Your little guy sure is growing...his baby teeth are going, as the big one make their way. Ahhhh! I love it! What a fun accessory for a game! Such a cute idea! I always liked fun stuff with my kids photos. That looks really awesome! I love being able to customize things! These are really cool, Rosie--great idea for a sports fan! This is perfect for kids on teams. I love it. These are so neat! I know this is something that Allison would probably really enjoy! This is super cool for any sports fan. My hubby would love it, kids too. These are so cute. My kids play all kinds of sports and they would love these. This is really cool! I've never heard of this before. My kids are huge into sports so this would be great! That is so cool! My kiddos would absolutely love this! What a cool idea. My kidlets both play soccer, this would be great for their games! That is such a fun and unique idea! Thank you for sharing, I would have never thought to try and make one! This sounds like a cute idea! My kids will love this. It is such a great idea! Now this is a great idea! What fun for kids to commemorate their hard work! Oh how neat is this?! I love things to celebrate a love of sports and I know my soccer boy would love this for sure. Thanks for sharing this with me! What a great idea! I would love this for my son! Thanks for sharing!! What a great way for your kids to remember the fun times they had playing sports! That is so neat. Great for a sports fan. What a cool personalized item to make! I can see using it to cheer them on during a soccer game! Really cute. My kids all played sports and would have loved to have one of these. That looks so cool! Thanks for the giveaway. This is so cool. I think my son would really like this. This is neat. My boys are too young for this, but when they do start sports they would love it. This is really great for boys. I think my 9 year old would really enjoy this. He loves making things. How cool! Perfect if you have a little sports fan in your life! What a great idea and how unique. I think many kids would love to have these to cheer their siblings or friends on. Oh those are really nifty!! I have never seen something like this before! What a neat and great idea. This would be great for my nieces who cheerlead. This is a really cool idea and would make a great thing to keep for years to come! I'm already looking into these for my newphew's Tai Kwan Do. Now, that's a great idea! It's my first time seeing this and love it! This is so cute. My cousins would love this as they are into sports in a big way! Super cool! These look like excellent gifts for my niece and nephew for football and cheerleading this year. That is a really cute idea! I love it. This is such a cute idea! I know a lot of kids who would love one of these. So neat!!! My oldest plays high school football so it might be neat next year in his senior year to make one for all 4 years. Thanks for sharing. This is so neat! My kids and I would have a lot of fun with this. Oh wow, that is too awesome! What an awesome keepsake! This is really neat and easy to assemble. It's a great way to display photos. Now that is just so cool - very nice for displays. My son doesn't get into sports too much right now, but this is pretty cool! Wow! What a pretty cool product! The things they have these days! This is a unique piece of art work. Haven't seen this kind of megafold here in our country. Good luck to all joining! That's a great thing to have, I know I always like showing off my kids anyway I can. Oh my kids would love those. They could cheer me on at my running events! What a great way to celebrate being a fan. This is such a great idea for kids! This is such an awesome idea. Not too complicated to make, but really cool to have! Love it. They have a really cute one for baseball fans. My Grandsons room is done in baseball so this would fit right in. that is super cute. My friends children are huge baseball fans this would be a good Christmas gift for them. This looks like it would be the perfect gift for a boy who loves baseball. What a smart idea for a lanyard and I like the fact that kids can pick their own photos/designs. This is really neat! My middle child loves soccer but doesn't play in school yet! When he does, I will keep this in mind! Great review! How fun! What a great idea for football season! This is very cute! What a great fund raiser item for football cheerleaders. That is very cool! How much fun would it be to take that to a game. So it makes a pretty cool megaphone?! I love the customizing! Now this is super cool for all sports, that would of be helpful at football season for sure. This is such a neat thing to have for sports! It looks like a lot of fun. great idea! her looks very happy having that with him! The video was easy enough to follow. This would be perfect to give to family members! This is a new idea for me. It is always great when you can integrate an interest or hobby into a craft. How neat is this! What a great way to display photos! There are so many neat products out there these days! 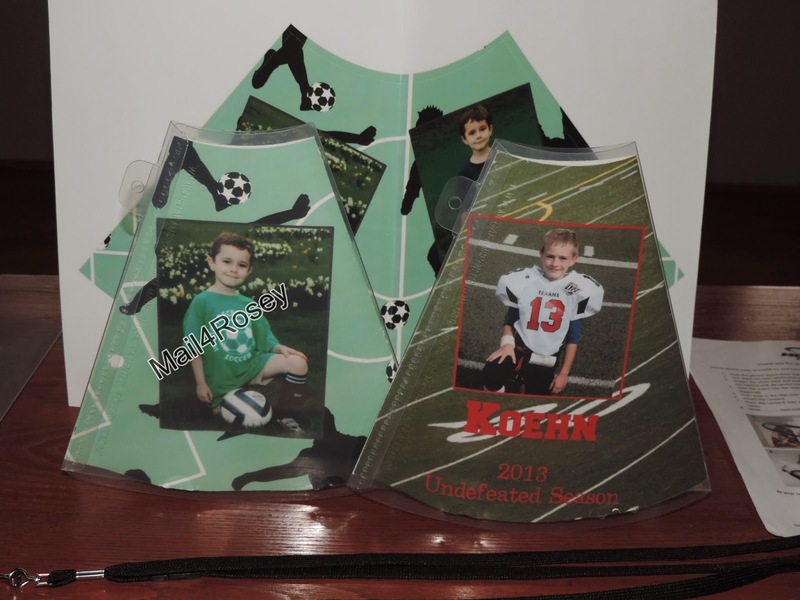 This one is a fun way to make a momento of your child's sports season! That is super cool! I bet it would be nifty to make your own megaphone like that. SO cool and very unique. My daughter plays softball! I learned at megafan sports website the checkout process is always safe and secure. i have two baseball playing nephews that i would love to get this for. i learned that they have some really cute ideas.